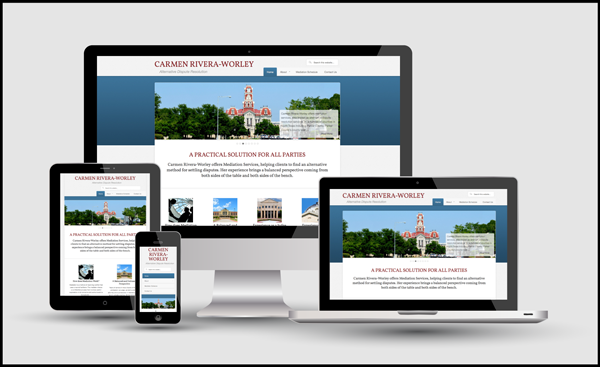 Carmen Rivera-Worley is a retired federal judge from the 16th Judicial Court in Denton County, Texas. 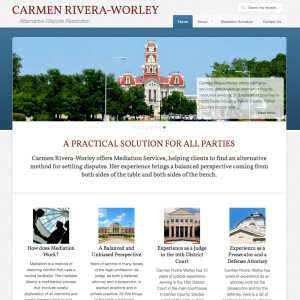 Ms. Rivera-Worley now offers mediation services as a practical and affordable method of resolving legal disputes. Websentia Web Services created this website using Wordpress and the Genesis-based Education theme from Studio Press. Keeping with the basic look of the Education theme, we configured the site to display Ms. River-Worley’s areas of expertise as well as her services, her schedule, and the geographic area she offers these services in. The design is responsive, adapting the the screen size of the computer or device used to view the site.